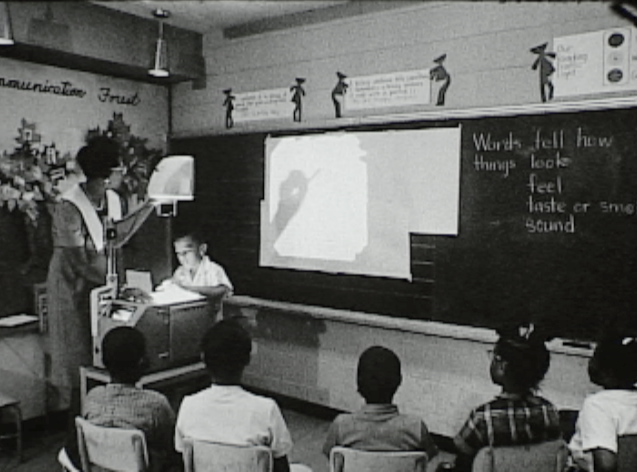 FROM A TO Z: THE STORY OF SPECIAL SUMMER SCHOOLS, Goldsholl Design & Film Associates for Chicago Board of Education [CPS General Superintendent of Schools, Benjamin C. Willis], 1964, B&W, Optical Sound, 27 min. A SOIL FOR GROWTH: A STORY OF THE GIFTED CHILD PROGRAM, Goldsholl Design & Film Associates for Chicago Board of Education, circa 1966, B&W, Optical Sound, 20 min. METRO!!! : A SCHOOL WITHOUT WALLS, Rod Nordberg, 1970, Color, Optical Sound, 18 min. Each of these 16mm films introduces a distinct and newly implemented CPS program: summer school programs (From A to Z), gifted student programs (A Soil For Growth) and the radical Chicago Public High School for Metropolitan Studies (Metro!!!). Combined, these three films offer a valuable glimpse into the country’s third largest public education system during a time of great educational reform. They incorporate and reflect the Chicago Board of Education’s response to an era when major institutions and social structures were being regularly challenged on a national basis. While the CPS has since cut or altered many of these programs, the content and stories within these films still offer some food for thought for the reshaping and reevaluation of Chicago’s public school system today. The films also provide an inspiring slice of history of the often volatile and turbulent relationship among the City of Chicago, CPS teachers and Chicago parents & students. 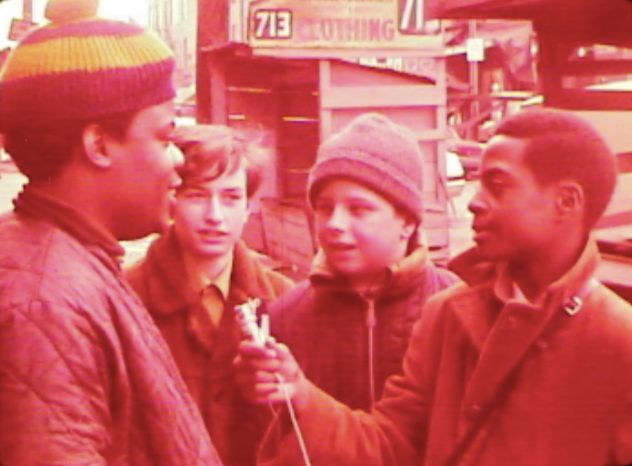 Chicago-based Goldsholl Design & Film Associates produced two of the films for the Chicago Board of Education, while local filmmaker & editor, Vince Waldron, produced the third. 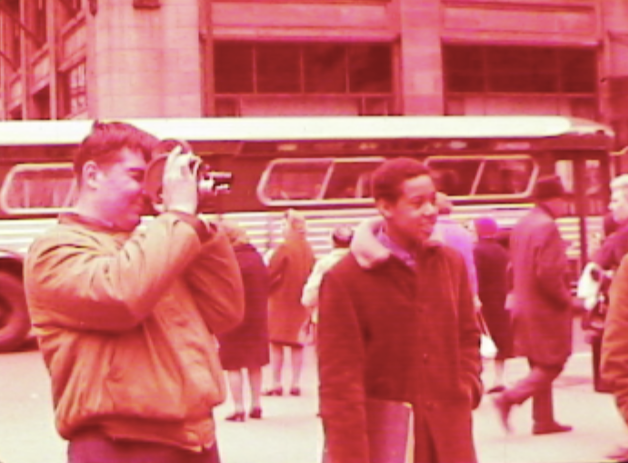 The Goldsholl Associate’s sponsored films thoughtfully present the views of their client and subjects, while Rod Nordberg offers a unique on-the-ground perspective of the newly formed Chicago Public High School for Metropolitan Studies or “School Without Walls” – a bold experiment by the CPS that operated from 1970-1991. The Goldsholls considered filmmaking a cerebral process that if allowed could thrive on serendipity. The firm’s two films made for the Chicago Board of Education are no exception, with the subjects at hand often mirroring the playfulness and experimentation of the firm’s own bustling design studio. 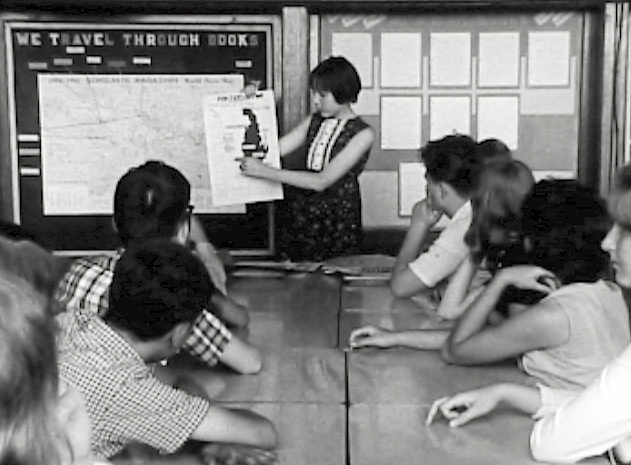 The films introduce viewers to newly instated programs within the CPS from the early to mid 1960’s by simply presenting facts and quietly observing each program. Often the films present vérité-style footage of active classrooms as well as non-scripted voices of students, teachers and parents. The non-obtrusive camerawork and candid voices in these films give them a distinct humanist tone, a tone that is often absent from the sponsored film genre. Similarly, Rod Nordberg’s Metro!!! : School Without Walls gives voice to the students and staff of the Chicago Public High School for Metropolitan Studies (aka Metro) and more broadly introduces viewers to this progressive “school without walls.” Metro was a four-year high school that was part of the CPS system from February 1970 to September 1991. For Metro students, the city was their classroom. Students took classes at Metro’s Loop headquarters but also at such varied locations as the Art Institute of Chicago, Lincoln Park Zoo, Shedd Aquarium and Second City. Unique in the CPS System, Metro sprung from the radical concept that students should take responsibility for their own education and that urban institutions and businesses represented countless and varied opportunities for educational enrichment. As former Metro history teacher, Paula Baron, states,“Metro was in the city, of the city and about the city.” Nordberg’s short film on the school gives us a rare glimpse into the early years of this ambitious program. All three of these films are sorely at-risk due to uniqueness, and in the case of Metro!! !, severe color fading. 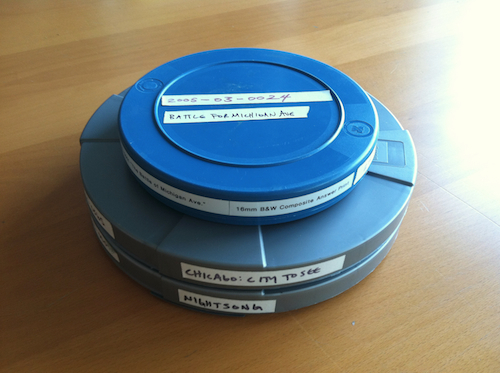 To the best of our knowledge, CFA holds the only copies (16mm composite prints) of all three titles. The Goldsholl Associates films reside in CFA’s Mort & Millie Goldsholl Colleciton, while Metro!!! resides in CFA’s Chicago Public Library Collection. We were also very fortunate to receive several additional composite prints and printing elements of Metro!!! from filmmaker Rod Nordberg (thank you Rod!). Unfortunately, all existing composite prints of Metro!!! have color faded over time. This NFPF grant will provide the funds to create elements and strike new 16mm composite prints of all three titles. It will also allow us to print Metro!!! on more color friendly 16mm film stock, giving us access to an accurate color version of the title for the first time in decades. We’ll be sure to keep you posted on the restoration process, and last but not least: Thank you NFPF! This afternoon we received our first DVD reference copy of the newly restored film, FACES AND FORTUNES. 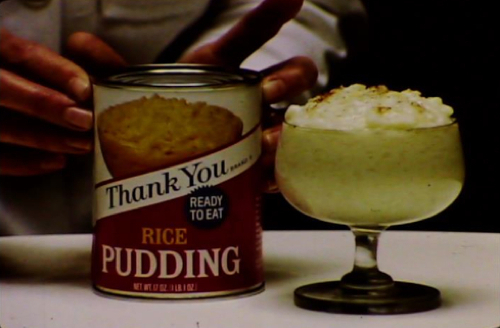 This 16mm sponsored film was made in the 1960′s by Chicago-based design firm, Goldsholl Associates, as a filmic treatise on “corporate identity” for Kimberly-Clark Corporation. It was directed by Morton Goldsholl, conceived by Millie Goldsholl, executed by Morton & Millie, Wayne Boyer and Larry Janiak and narrated by Hans Conreid (!). Through live action sequences, delightful animation and simple design aesthetics, the film explores the legacy and importance of “personality” or branding of industries, organizations and companies throughout the ages. Unfortunately the only 16mm prints we previously had of this title were extremely color faded. Thanks to a grant from the National Film Preservation Foundation and to the talented folks over at Colorlab (we call them magicians over here), the film has been color corrected back to its original glory and put back onto 16mm film. Take a look below for some stunning before and after shots…and stay tuned for more info on the premiere of this new print (the wheels are turning)! 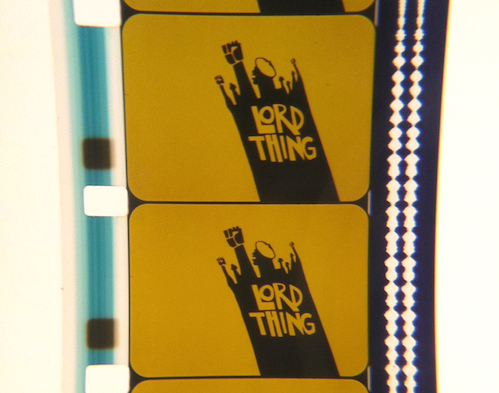 We recently received the 16mm restoration print of LORD THING, and boy is it beautiful! DeWitt Beall’s LORD THING (1970) is a film that documents the Conservative Vice Lords of Chicago’s near-west side and dozens of small neighborhood gangs from different parts of the city, that in time, unite forces in a common cause. Only a muddy VHS copy of the film had been circulating until CFA recently discovered 16mm prints & original elements in storage and under the care of Beall’s widow (these prints & elements now reside within CFA’s Dewitt Beall Collection). 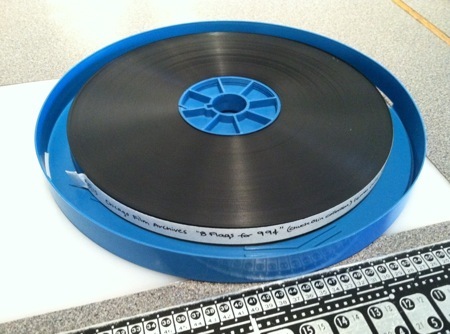 Thanks to a 2012 grant from the National Film Preservation Foundation, CFA was able to create a new restoration print from original production elements. Maryland based Colorlab did an exquisite job creating the two reels of LORD THING from original A/B Rolls and a master 16mm magnetic track. We’re especially impressed by the improved audio quality, which is significantly richer in comparison to our existing composite prints (meaning, prints with synced imaged and sound) of LORD THING currently stored at CFA. Interested further in the restoration process of LORD THING? Read on! We were really lucky to have original production elements (A/B Rolls, Mag Tracks, etc) to create a new composite print of LORD THING. A lot of the times with restoration projects, we’re left having to make a new print from an original or master positive print (no complaints! It’s just not an ideal scenario since it often leads to some degradation of image and sound). Having original elements allowed Colorlab to produce a print comparable or perhaps even better to the original composite prints struck by Dewitt Beall & co in the early 1970′s. We were also fortunate to have three composite prints on hand for reference during the restoration process of LORD THING. The tricky issue with these prints, though, is that we began this process with two complete copies of LORD THING (Version 1), and only 1 copy of LORD THING (Version 2), which happens to have French subtitles. In others words, there was no composite print of Version 2 without subtitles (CFA considers Version 2 of LORD THING to be the more complete as well as final version of the film). This restoration project has remedied this tricky situation, giving us (a universal “us”) a presentable preservation print of Version 2 (without subtitles) for the first time! Be on the lookout for a restoration premiere sometime this fall – we’ll be sure to keep you posted! We recommend joining our mailing list if you don’t want to miss out. This morning we packed up three CFA films to ship off to our nations capital. They’ll take part in the National Gallery of Art’s annual showcase of film preservation from international archives and special collections. This year’s programs range from rediscovered American rarities to artists’ films and unsung shorts from the 1960s, and to major French classics celebrating their fiftieth anniversaries this season. These three CFA films (Margaret Conneely’s Chicago: City to See in ’63, the FilmGroup’s Social Confrontation: The Battle of Michigan Ave. and Don Klugman’s Nightsong) will be shown at the The City in the ’60s: Forgotten Films from American Archives program on Saturday, July 20th. Thanks to grants from the National Film Preservation Foundation (Battle of Michigan Ave., Nightsong) and Women’s Film Preservation Fund (City to See in ’63), all three of these films were photo-chemically preserved, or rather, new film prints were struck of each title (more on that, here). Ok, back to the program – here’s what the National Gallery of Art’s site has to say about it: “As recently as the last half of the twentieth century—in theaters, churches, private clubs, and especially schools, where the core curricula could always benefit from some audio-visual enhancement—the projection of 16 mm films was a regular occurrence. Thousands were produced each year on every subject imaginable. Although many 16 mm collections have now been discarded in favor of digital, there are many archives that treasure and preserve this fragile format for its historical value. In their recently published Learning with the Lights Off, Marsha Gordon and co-editors Devin Orgeron and Dan Streible examine the educational film in its endless variety—from art to music, biology to medicine, suburban sprawl to urban decay. Marsha Gordon introduces a program designed around the city in the 1960s that includes screenings of entertaining and informative films representing Washington D.C., Los Angeles, New York, and Chicago: Village Sunday, Three Cures for a Sick City,The Battle for Michigan Avenue, Felicia, and Jim Henson’s Time Piece.” As mentioned above, the program is a presentation around the book Learning with the Lights Off. Edited by Devin Orgeron, Marsha Orgeron and Dan Streible, the book is the first collection of essays to address the phenomenon of film’s (more particularly educational and nontheatrical films) educational uses in twentieth century America. Luckily for you Washingtonians, Marsha Oregon will be on hand at the screening to discuss the films and the book. We’re super honored to take part in this screening and to share these pristine 16mm film prints with the D.C. area (we wish we could be there!). And last but not least, friendly shout outs to the other archives/institutions involved in this particular screening: Raleigh based A/V Geeks and the Reserve Film and Video Collection of The New York Public Library for the Performing Arts. More on the screening here. CFA is happy to announce that the National Film Preservation Foundation has awarded CFA another grant to photo-chemically preserve four more films from the archives. FACES AND FORTUNES, DISINTEGRATIONS LINE #1, DISINTEGRATION LINE #2, and ADAM’S FILM all reflect the influence of the “American Bauhaus” movement introduced by Laszlo Moholy-Nagy during the late 30s/early 40s in Chicago. Designer and filmmaker team Morton and Millie Goldsholl were students at the School of Design in the 40s. The impact Moholy-Nagy had on them was immediate and concrete. The couple moved their already successful design studio to a larger space in Northfield, IL and added a film department that was headed up by Millie. Larry Janiak was one of their first employees at their film studio. These four films are early and stellar expressions of the midcentury Bauhaus influence in Chicago. We are so pleased to have this opportunity to preserve modernist titles in our collections. To date CFA has sheperded the photo-chemical and digital preservation of 91 Chicago and Midwest films with the support of the National Film Preservation Foundation, the Women’s Film Preservation Fund, The Gaylord and Dorothy Donnelley Foundation and the National Endowment for the Arts. We plan to keep this number growing in order to create a complex and nuanced portrait of our region for generations to come. More on Janiak’s films here. The National Endowment for the Arts (NEA) has awarded CFA another grant to further process the Ruth Page Collection. 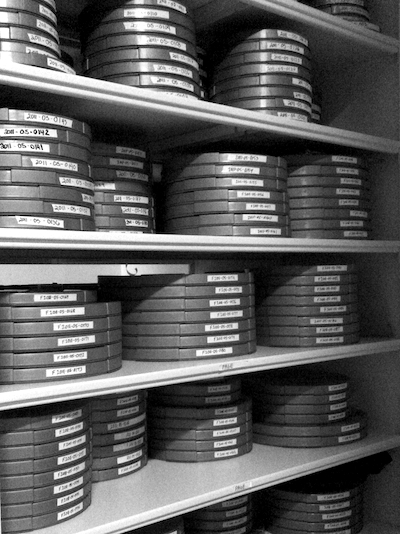 This means the 16mm films and videotapes in the collection will be digitized, giving the folks at the Ruth Page Center for the Arts, dance scholars, historians, student dancers, and anyone who has an interest in artistic movement access to these materials. Thank you to the NEA for recognizing Ms. Page as a Chicagoan who made her mark worldwide in the field of dance. As the coming year unfolds, be on the look out for her performances on our website. And special shout outs to our talented intern, Harry Eskin, who hand inspected the collection’s tricky production elements AND to the young video makers from Whitney Young High School who are making a short biopic about the renegade and very American choreographer Ruth Page. Read the official NEA press release here. …to so many people. CFA has kept its doors open, the back room chilled, the bench occupied and the telecine humming because of your decisions to support us. We are creating a massive 20th century Midwest/Chicago moving image time capsule that is built by each CFA customer, each CFA donor, and each foundation and agency that supports our work. You got us started in the huge and worthy task of processing the magnificent Ruth Page Dance Collection – with thanks to the National Endowment of the Arts who was later joined by the Gaylord & Dorothy Donnelley Foundation to make this happen! Already, two 1928 35mm Ruth Page films – BOLERO and CARMEN – are being restored and preserved at Colorlab in Washington, DC. And 80 of the earliest Ruth Page videotapes are making their way to Bay Area Video Coalition (BAVC) for transfer to digital preservation files. You made it possible to begin unwrapping the work of the late and unheralded avant-garde filmmaker JoAnn Elam. It’s a complicated collection that reflects the life of its complicated creator. Thanks especially to Susan Elam, Joe Hendricks, Chuck Kleinhaus and Julia Lesage for providing a large offering of support, light and clarification to this collection. I am also grateful to those who have begun and to those who have continued to invest in CFA’s mission and future this past year. Our board members old and new have underscored and advanced our 2012 activities in an economy that has strained most all of us. Chicago artists and studios (that would be you, Jessica Bardsley, Tim Kinsella, Andy Resek, Ellen Castleberry, Josh Abrams, Kent Lambert, CAVE, Monica Jost and the Experimental Sound Studio!) have contributed their talents and skills to create new works of moving image art, utilizing CFA’s films. Our very small team of metadata pros, researchers and programmers completed a very large and well-populated online database…and even well after the last check was written, they shored us up when CFA glitches arose (Thank you, Seth!). Foundations both national and local (hugely grateful to the Richard H. Driehaus Foundation, Art Works Fund and Illinois Arts Council) have allowed us to establish rich and massive goals. Our interns have always made these goals attainable. CFA customers continually seem to “get it” that they contribute to the salvaging and preservation of the Midwest moving image legacy each time they use our services. Thank you to the Morrison-Shearer Foundation and the Chicago Academy of Sciences that invest in the legacies their own collections contain. And CFA’s Collections Manager Anne Wells conducts this all from the front office with grace and composure hard to match. Below is a press release from Imogen Smith over at the Dance Heritage Coalition (DHC). In June, we volunteered our services to the DHC and the New York Public Library for the Performing Arts by hand inspecting, re-housing and digitizing a reel of 16mm film featuring an early work of the performance duo, Eiko & Koma. We are happy & honored to be a part of the team that is working to uncover our country’s dance heritage. Here at home we are attending to the legacies of Ruth Page and Sybil Shearer. Pictured above left: White Dance c.1973, choreographed and performed by Eiko & Koma. Film still, title: unknown, creator: unknown. ; Pictured above right: Eiko’s first viewing of the CFA’s digitization of the newly discovered film. New York City – The Dance Heritage Coalition (DHC) is pleased to announce the exciting discovery of the earliest existing film footage of Eiko & Koma performing. The film, found last month among the company’s records during the Dance Heritage Coalition’s inventory of Eiko & Koma’s legacy materials, has been stabilized and digitized, and is now viewable again through the generosity of Nancy Watrous and Anne Wells at the Chicago Film Archives. The discovery was made during an inventory of the company’s materials conducted by DHC Preservation Fellow Patsy Gay with the help of dance scholar Rosemary Candelario. In addition to providing the first comprehensive inventory of Eiko & Koma’s materials, this project involves identifying and remedying conservation concerns and improving workflow arrangements. It lays the groundwork for future preservation of E&K’s archives and allows the artists a major role in shaping their own artistic legacy. Since the summer of 2011, the DHC has conducted five inventories of key dance companies’ collections in San Francisco and New York City. Funding for these projects was provided by The Andrew W. Mellon Foundation. 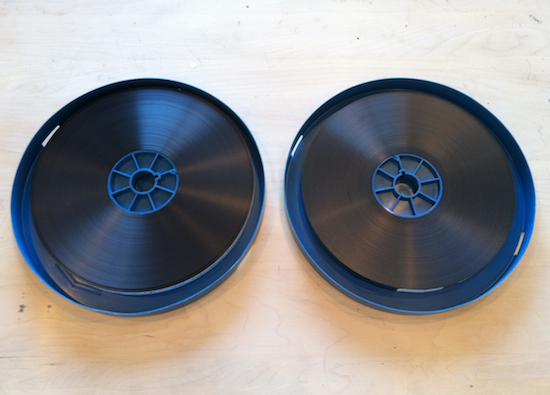 The mysterious and unassuming single reel of 16mm film was identified with the help of Tanisha Jones, director of the Archive of the Recorded Moving Image within the Jerome Robbins Dance Division, New York Public Library for the Performing Arts. It turned out to be a lost film documenting Eiko & Koma in Amsterdam circa 1973. Before the duo’s United States debut, Eiko & Koma had studied with Kazuo Ohno in Japan and Manja Chmiel in Germany. During 1973, they lived in a studio they called Dance Laboratory, which was in an old school building in Amsterdam. In 1976 they moved to New York where they have been living and working ever since. The 12-minute silent film consists of a series of short segments documenting Eiko & Koma performing a variety of material both solo and together. It also captures the pair’s informal interactions offstage. This footage, as the earliest-known example of Eiko & Koma’s dance work, illuminates an under-documented time in their career and captures the budding of the pair’s artistic partnership. The short vignettes of movement, while raw and unrefined, clearly show the pair’s signature choreographic style, albeit in embryonic form. Despite the casual storage and housing, the film is in good condition, having experienced only minor color fading and mild surface abrasions. Upon hearing about this discovery, Nancy Watrous generously offered the expertise and resources of the Chicago Film Archives, which is a leader in film preservation. Their capable staff stabilized the reel by inspecting, cleaning, and rehousing it. They also digitized the film, which allows the material to be easily watched and saves the original item from the wear and tear of handling and viewing. Thanks to Nancy Watrous and Anne Wells at the Chicago Film Archives, this precious dance historical treasure is now safely preserved for the future. The National Endowment for the Arts (NEA) Chairman Rocco Landesman announced today that Chicago Film Archives is one of the 788 not-for-profit national, regional and state organizations nationwide to receive an NEA Art Works grant. These Art Works grants support the creation of art that meets the highest standards of excellence, public engagement with diverse and excellent art, lifelong learning in the arts, and the strengthening of communities through the arts. The NEA received 1,624 eligible applications under the Art Works category for this round of funding. The Chicago Film Archives has been awarded its full request from the NEA and expects to meet the required match this coming year to stabilize the Ruth Page Dance Collection in its entirety. Ruth Page was an extraordinary pioneer of dance in America. The moving image collection acquired by the Chicago Film Archives is an irreplaceable treasure. The Archives, by preserving and protecting this legacy, are ensuring that this treasure will be available for generations to come. I congratulate the Archives, and all the dedicated people who work there, on winning this grant and applaud their vision and initiative in undertaking this project. We are ready to get started on this fascinating collection from Chicago’s premiere and iconic twentieth century dance figure. Containing nearly 1,000 items, CFA will stabilize, digitize and catalog this collection over a three-year period. It’s with great honor that as a result of this grant, CFA will soon be able to publicly present the history, accomplishments and artistry of the Chicago dancer and choreographer, Ruth Page. By building upon both the Ruth Page and the Morrison-Shearer Foundation dance collections, CFA can begin to retell Chicago’s history of dance.